On the morning of 9/11/2002, Christina was writing away in her home office, luxuriating in the morning sunshine, happy in the security of her world. However at 8:47 am, life as Christina and the entire world knew it was forever changed. 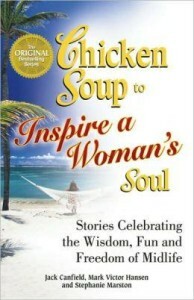 Her essay titled, “Why Are You Waiting?” was chosen for inclusion in this extraordinary Chicken Soup Collection dedicated to the Soul of America. Romance comes in all shapes and forms and in this essay by Christina, titled, “A Friend’s Secret”, the definition of the word is found in drawers, cabinets and even tucked in a lunch bag. Have you ever found yourself unexpectedly caught off guard by the emotion of a moment? Christina shares just such a moment in her essay, “Life Lessons Well Learned”, when while speaking at a high school career day she received as much as she gave.